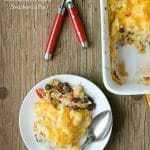 A spicy spin on a simple, traditional comfort dish, Southwestern Turkey Shepherd's Pie, changes up the vegetables with southwestern flavors delivering a soul-warming casserole with turkey and cheesy mashed potatoes. This dish is a perfect way to use up extra holiday turkey and mashed potatoes too! In a large skillet, heat the oil over medium-high heat. Add onions and sauté until they begin to turn translucent. Add the sweet peppers and continue to sauté 2-3 minutes. Remove from heat. Add the black beans, corn, green chilies, turkey and salsa; stir to fully combine. Spoon into a 9 x 13 inch baking pan and spread evenly covering the bottom of the pan. Spread the mashed potatoes over the turkey-vegetable layer to cover. Sprinkle the grated cheese on top. Bake for 30 minutes until fully heated through. Can broil for the last few minutes to make the top crispy.